Frequently Asked Questions about hand controls from our customers. See our AMS Vans mobility experts install and demonstrate commonly-equipped mobility items. Helpful articles that explain the different accessibility equipment options, and more! Dan was awesome! We had him move a lift from our old van to our new van. He was very professional, friendly and so easy to deal with. He did a great job and we would recommend AMS to anyone needing help with handicap vans. Get know-how, advice, and live demos from your AMS Vans mobility experts. 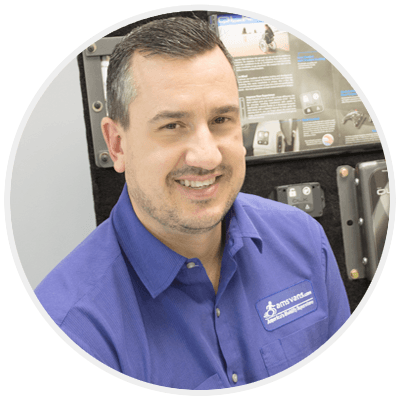 Use the button below to connect with our Mobility Product Manager, Mr. Dan Arbuckle and his team of mobility equipment experts. Portable wheelchair mobility ramps and folding handicap ramps for wheelchairs, power chairs, and scooters are available through AMS Vans. These portable ramps have no-slip surfaces for improved traction and resist dirt and wear, making them an ideal choice for both indoor and outdoor use. The portable ramps are available in 2’ – 6’ lengths and in either single-fold, multi-fold or extended reach for an attachment on a portable ramp. 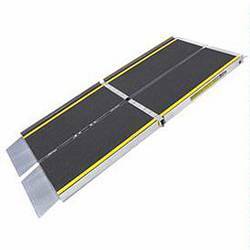 These folding handicap ramps from AMS Vans are simple, length-wise folds that make these mobile ramps easy to use and transport. The single-fold portable ramp, multi-fold ramp or extended reach attachment are compatible for indoor and outdoor use. The portable wheelchair mobility ramps easily fold and store using a minimal amount of space. Single Fold Portable Wheelchair Ramp by Harmar Mobility is a portable solution for smaller elevation changes. The Multi-Fold Portable Wheelchair Ramp gives users a portable solution for larger elevation changes. Multi-Fold ramps feature width and length-wise folding for ease of transportation in Wheelchair Vans, Minivans, cars, and other accessible vehicles. 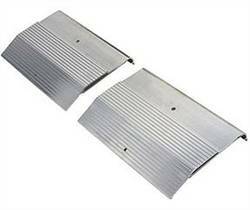 These extenders are bolted to portable ramps and are used to help bridge the distance over bumpers from wheelchair vans or other handicaped accessible vehicles. Compatible for indoor and outdoor use, the portable ramps easily fold and store using a minimal amount of space. 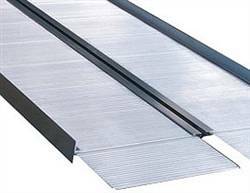 Looking for electric wheelchair ramps for vans? Click here to view the different conversions with powered ramp options.